The Organization of Ibero-American States (Spanish: Organización de Estados Iberoamericanos, Portuguese: Organização dos Estados Ibero-americanos; abbreviated as OEI), formally the Organization of Ibero-American States for Education, Science and Culture, is an international organization made up of 23 members states of Iberophone nations in Europe and the Americas, as well as one member in Africa. 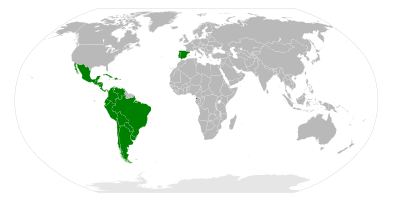 The OEI’s membership is composed of all of the sovereign nations of Ibero-America and the Iberian Peninsula, as well as Equatorial Guinea. All members are Portuguese and Spanish speaking nations, in addition to Andorra, which is predominantly Catalan speaking, though the organization does not include all the Iberophone nations of the world. The OEI was founded in 1949 as an international agency, the Office of Latin American Education, as a result of the first Latin American Education Congress in Madrid. In 1954 the second congress was held in Quito, where it was decided that the OEI would become an intergovernmental organization of sovereign states. On March 15, 1957, at the third Education Congress in Santo Domingo, the first statutes of the OEI became effective until 1985. In 1979, the fourth congress met in Madrid; in 1983 the fifth congress took place in Lima. In May 1985, an extraordinary meeting of the congress was held in Bogotá, where it was decided to change the name of the OEI to its present name (keeping its acronyms and extending its objectives); the Latin American Education Congress became the General Assembly. At the December 1985 directive council meeting in Panama, its members agreed to the present statutes of the OEI, replacing the 1957 text and approving the organization’s regulations. Since the 1991 Ibero-American Summit in Guadalajara, the OEI has promoted conferences of ministers of education and the execution of the educative, scientific and cultural programs delegated to it. The purpose of the OEI is to promote intergovernmental cooperation among its member nations, primarily in the fields of education, science, technology and the arts. Its General Secretariat is located in Madrid. Financing of OEI operations and programs is derived from obligatory quotas and voluntary contributions from the governments of member nations and private cultural and educational institutions and foundations. The OEI consists of three bodies: the General Assembly, the Directive Council and the General Secretariat. The General Assembly, the supreme authority of the organization, is composed of representatives (or delegations) from member States. It establishes OEI policies, evaluates and approves the organization’s plan of activities, program and global budget, fixes annual dues and chooses the secretary-general. The Directive Council is delegated by the General Assembly to control the OEI’s government and administration. Made up of the member states’ ministers of education (or their representatives), it is governed by the education minister of the country in which the next General Assembly meeting will be held. Its primary function is to analyze and approve the report of activities, programs, the biennial budget and the OEI’s financial statement. The General Secretariat is delegated by the General Assembly as executive director of the OEI, representing it to governments, international organizations and other institutions. It directs, administers and executes the organization’s programs and projects. The General Secretariat has a flexible internal structure, adaptable according to policies, strategies and the plan of activities.